All turning class through April will be rescheduled once instructor has recovered from an accident. This class is a great introduction to the world of turning, a skill that can be incorporated into furniture building or general woodworking projects as well as to produce turned objects such as spindles, bowls, pens, and round boxes. Whether you have a lathe at home and want to learn how to use it, or you plan to come to CCSA’s Woodworking Studio to make projects there, this class is for you! In this class you will learn the ins and outs of turning wood. Starting with an introduction to the lathe you will learn how to turn several basic shapes. 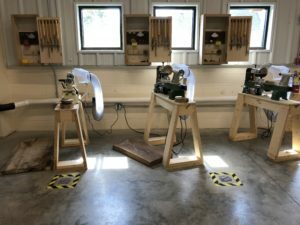 This class covers basic safety, machine components, tools, and basic operation of the tools and equipment while making different shapes of wood. Students will then learn how to sharpen the blades and begin making spindles, ornaments, and bowls. This class meets for class time on Tuesday evenings, included in the tuition fee are Thursday evening Open Studio sessions to practice the skills. Students are required to provide their own ANSI certified face shields which can be purchased locally at Lowe’s Hardware or Tractor Supply. They can also be purchased online. For safety purposes students should wear close toed shoes and refrain from any loose clothing or dangling jewelry. Any long hair should be tied back. The materials fee includes wood for turning spindles and blanks for bowls. Extra blanks may be purchased at class time.